The front seats and all head restraints must be adjusted to match the body size at all times and the seat belt must always be fastened properly to provide the most effective levels of protection to the passengers. Each occupant must correctly fasten the seat belt belonging to the seat. Children must be fastened » page 19, Transporting children safely with a suitable restraint system. If the occupant adopts an incorrect seated position, he is exposed to lifethreatening injuries, in case he is hit by a deployed airbag. If the occupants on the rear seats are not sitting upright, the risk of injury is increased due to incorrect routing of the seat belt. The seat backrests must not be tilted too far back when driving, as this will impair the function of the seat belts and of the airbag system – risk of injury! For your own safety and to reduce the risk of injury in the event of an accident, we recommend the following settings. Adjust the driver’s seat in the forward/back direction so that the pedals can be fully depressed with slightly bent legs. Adjust the seat backrest so that the highest point of the steering wheel can be reached with your arms at a slight angle. 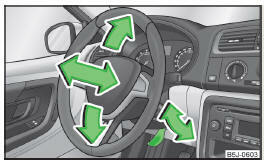 Adjust the steering wheel so that the distance A between the steering wheel and your chest is at least 25 cm » Fig. 1. Adjusting the steering wheel » page 8, Adjusting the steering wheel position . Adjust the head restraint such that the top edge of the head restraint is at the same level as the upper part of your head B . Correctly fasten the seat belt » page 10, Wearing seat belts. Setting the seats and head restraints » page 66 . Always assume the correct seated position before setting off and do not change this position while driving. Also advise your passengers to adopt the correct seated position and not to change this position while the car is moving. Maintain a distance of at least 25 cm from the steering wheel, and a distance of at least 10 cm between the legs and the dash panel at the height of the knee airbag. Not maintaining this minimum distance will mean that the airbag system will not be able to properly protect you - hazard! When driving, hold the steering wheel with both hands firmly on the outer edge in the “9 o'clock” and “3 o'clock” position. Never hold the steering wheel in the “12 o'clock” position or in any other way (e.g. in the middle or inner edge of the steering wheel). In such cases, you could severely injure your arms, hands and head when the driver airbag is deployed. Ensure that there are no objects in the driver's footwell, as these may get caught in the pedal apparatus when driving or braking. You would then no longer be able to operate the clutch, brake or acceleration pedals. The height and forward/back position of the steering wheel can be adjusted. Swivel the lever underneath the steering wheel downwards » Fig. 2. Adjust the steering wheel to the desired position (with regard to the height and forward/back position). Push the lever upwards to the stop. Never adjust the steering wheel when the vehicle is moving only when the vehicle is stationary! For passenger safety and to reduce the risk of injury in an accident, the following instructions must be observed. Adjust the head restraint such that the top edge of the head restraint is at the same level as the upper part of your head B » Fig. 1 on page 7 » page 7. Correctly fasten the seat belt » page 10. In exceptional cases the front passenger airbag can be deactivated » page 17, Deactivating airbags. Maintain a distance of at least 25 cm to the dash panel. Not maintaining this minimum distance will mean that the airbag system will not be able to properly protect you - hazard! Always keep your feet in the footwell when the car is being driven – never place your feet on the instrument panel, out of the window or on the surfaces of the seats. You will be exposed to increased risk of injury if it becomes necessary to apply the brake or in the event of an accident. If an airbag is deployed, you may suffer fatal injuries when adopting an incorrect seated position! To reduce the risk of injury in the event of a sudden braking manoeuvre or an accident, the occupants on the rear seats must observe the following. Adjust the head restraint such that the top edge of the head restraint is at the same level as the upper part of the head B » Fig. 1 on page 7 » page 7. Use a suitable child restraint system if transporting children in the vehicle » page 19, Transporting children safely. The maximum protection which seat belts can offer is only achieved if your seatbelts are fastened correctly. Incorrect seated positions considerably reduce the protective functions of the seat belts and therefore increase the risk of injury due to an incorrect routing of the seat belt. The driver is fully responsible for himself and passengers, especially children. Never allow a passenger to adopt an incorrect seated position when the car is moving. The following list contains instructions which, if not observed, may lead to serious injuries or death. This list is not complete, however we would like you to familiarise yourself with this subject. Observe the following instructions while driving. Do not stand on the seats. Do not kneel on the seats. Do not recline the seat backrest too far. Do not lean against the dash panel. Do not lie on the rear bench seat. Do not sit only on the front edge of the seat. Do not sit facing to the side. Do not put your feet out of the window. Do not put your feet on the dash panel. Do not put your feet on the seat upholstery. Do not transport somebody in the footwell. Do not drive without wearing a seat belt. Do not sit in the luggage compartment.